Jeannette Rairibi was born to immigrant parents, and while some of us might have struggled to reconcile our two different cultures, Jeannette was quick to see the advantages. Jeanette sees the blessings and opportunities we have in this land, and she’s here to remind us of the importance of education in a world where knowledge is power. The most memorable moment. Probably when, um — I’ve had several; probably when I graduated, that was a real milestone. And then obviously when I had the birth of my children. They’ve been very memorable moments. So I can’t really think of one moment, but there have been several. I’ve been really, I guess, blessed. Believe it or not, as a child I always used to play school teacher [laughs]. And we used to have a whiteboard, and I was always the teacher writing on the whiteboard. I used to love writing on whiteboards, um, ringing a bell. It’s like it grew on from there. Yeah, I think so. Even though I didn’t know it, I think it was probably an aspiration from quite young. Did you become what you wanted to be as a child? Yes. I think teaching has been — um, finding a passion for teaching is working, first of all, with children, and secondly trying to make a difference in some of the children’s lives. Sometimes you get children who are quite difficult, and you know that having made [a] difference or having inspired them to become something that they want to [be] later on is very rewarding. Do you feel honoured that you’re part of the journey, as in, their education life? I think yeah, definitely. 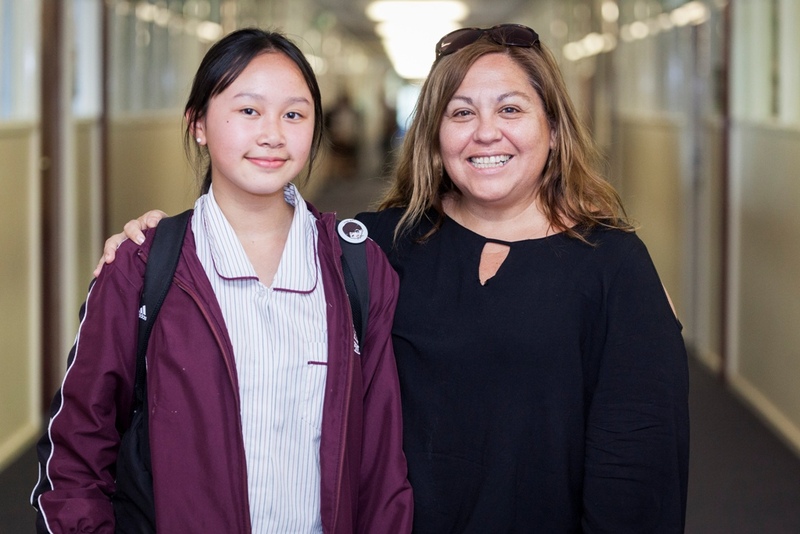 Even though sometimes we may think that we’re not really making much of a difference — like I was explaining to you just previously, with my Year 9 it’s been a real challenge. But when you see them, for example, write a paragraph and struggle writing a paragraph, and then struggling and writing a page, it’s an achievement within itself, do you know what I mean? It’s like little steps, and it all counts towards becoming who they’re going to be later on. My passion now? It’s not related to school unfortunately [laughs]. My passion now is to travel and to visit different places, see different cultures, meet different people. I think all these influence who I am as a person, and you need that kind of new focus in life, I think. How is it like, travelling all around the world? I haven’t done that yet, but I’ve travelled to different places and I absolutely love it. Because my other passion is history and culture, I’m pretty much aware of the places where I’m going and I know exactly the places that I want to visit and what I want to see. So, I think that helps, so it’s like I’m travelling with a purpose, not — do you know what I mean? Yeah, not just travelling for the sake of just having a good time. I would love to go to Africa one day. Um, yeah, I think Africa. Definitely. Do you have immigrant parents? Yes, I do. Yeah, and I think that that’s where the focus and passion for education came from. My parents migrated to Australia when I was young, so English is not my first language. Spanish was my first language, so I had to learn [English] from scratch. And the irony is, of course, that I am now teaching English. My main subject is History, sub-major English, but I’m teaching English, so. Um, my parents were very interested and always have been in education, and I think that that kind of paid off because it made us [have] a passion, you know, for reading and literature and all those things. What was it like growing up with immigrant parents? I think it’s having the best of both worlds. Being exposed to another culture, different values, and different foods — you know, different everything. And then stepping out of that door and being [immersed] into another culture, the Australian culture, so — and the Australian culture is always fascinating because it’s not just one, as you know, we’re living in a multicultural country and we’ve got the best of everything. So we’re very, very lucky to be living in Australia, I think. And having come from immigrant parents. How was your childhood, growing up bilingual? Um, okay, at the beginning I think it was a bit of a struggle because I didn’t know how to speak the language. Once you master the English language I think it’s not that difficult. If your first language is highly developed, then the second language will be highly developed because you can translate concepts in your head. Do you know what I mean? When you go from one language to another language? And if you’ve got the concept in your mother tongue you are able to translate that in the second language, which is English. So, um, I didn’t really struggle that much. Of course there was that stigma [at school] of, you know, ‘you’re a wog’ if you came from ethnic parents. But most of my friends were Greek, Italians — and I didn’t really hang around with many Latin girls, but it was okay for us wogs to call each other wogs. But it wasn’t okay for an Anglo to call us wogs, you know what I mean? So, yeah. But there wasn’t a lot of racism. Yeah, yeah. It was just light, you know. When you joke with people, and, yeah. What object, smell, or taste brings you back to your childhood? Ooh, um, what brings me back to my childhood? Oh, there’s the specific smell of a perfume that reminds me of my grandmother [laughs]. And that kind of, um — you know, she always smelled wonderful, and um, she — even though she wasn’t going out anywhere, she used to be immaculate. She stayed in the house but, you know, she wore lipstick and she was immaculate, and there was a specific smell of perfume she used to wear. It doesn’t matter where I smell it, it reminds me of her. Obviously her cooking as well, um, that goes hand in hand I think. Yeah, that never goes away. And I guess I’m still very lucky and very blessed to have both of my parents; so I guess as I grow older, you know, when they pass away, there will be certain smells that will remind me of my mother’s cooking. Um, reading is one of my hobbies. And I used to play a lot of tennis, I don’t anymore. But apart from reading, just listening to music and relaxing. Going for coastal walks, because I live near the beach. Um, yeah, that’s my relaxation and hobbies. Reading? Any historical based — um, so historical fiction and things like that. If anything has got some remote mention of history or a time context that I can relate to, that’s my favourite. What about your least? [laughs] My least is probably romance. I’m not a romantic at all. So, romance, hey — I’m a married woman, that’s as romantic as it gets [laughs]. Not a lot. What was the most tragic moment in your life? The most tragic moment of my life was probably when my grandmother passed away. Only because she had always been part of my life, and then all of a sudden there was, like, a void. You know, she’s there one day and then she’s not the next, and dealing with the concept of death is a big thing. And I was an adult — my children were little, so they were really lucky to have met her. I can’t imagine how people deal with death as a young person. So, I guess I was lucky, but that was one of the hardest things to overcome. How did it make you a stronger person? Yeah yeah, that’s fine. [Who] was your role model? Like, your main [one]? I think my grandmother, yeah. She was very strong, she was very — she always made very wise decisions. Just the thought process, you know — when you’re making a decision in your life, you need to consider different aspects because your decision will impact other people as well, do you know what I mean? So she always used to say, ‘Think about things before you decide. Because if not, it will impact people in a negative way rather than having a positive influence on other people’. So, I guess she was my role model. Do you think she made you the person who you are today? Um, I don’t know. I think — no, I think I owe [that] to my parents. Do you inherit a lot of stuff from her? Um, I don’t know, nobody has ever told me that [laughs]. You know when somebody says, ‘Oh, that’s your grandmother or whatever’. So I don’t know, um, that’s a hard question I think. But a lot of people tell me that I’m very much like my mother, you know, characteristics and, yeah. Very short-tempered [laughs]. So, what is the meaning of freedom to you? Ooh, freedom. Freedom is really important to me, actually. Having the freedom of speech, to be able to speak your mind, is really important. And for that, you need to obviously be an informed individual. Because a lot of people, you know, want to speak their mind, but if they’re not informed then there’s no value in what they’re saying. So, I think to be well read and to be well informed is really important. To be able to speak and voice your opinion, and to be a voice for people that are not educated, or to be the voice for the poor or the less fortunate people. That’s freedom of speech. But also I think that literature allows you to have freedom of the mind, because it can take you to unknown places or places that you have never seen. Um yeah, I value that. I think it’s really, really important. Do you feel happy and free in this country? Yes, yes. We have got the freedom of speech, we have the freedom to do marches — there will always be in any society, and anywhere we go, there will be rules and regulations; but they’re put in place so that there’s some kind of order, obviously. And within that, yeah, I think we are very lucky because in some countries women have very little freedom. So, we are really blessed. Yeah. Well, thank you for being part of my interview. Yeah, it’s kind of extended it a bit more. Yeah, okay excellent. Yeah, but we’re lucky because in some countries people don’t have freedom of speech. So, you know, politics and government dictate what they want and you’ve got no say in matters. Like, look at Australia right now, you know, we’ve been given the opportunity to vote whether we agree or not with gay marriages and things like that. In many countries that would not have been a choice, at all. Girls have got the freedom to be educated; in a lot of countries girls don’t have a voice. You’re only going to be a housewife for the rest of your life, so why do we need to educate you? So we’re given lots of rights and freedoms in this country; we’re really, really lucky. Very blessed. Yeah, so, this is what people don’t understand, and I think if you make them see that they will take on and appreciate all the opportunities that they are given, you know. I should speak like that to my Year 9s [laughs]. I try. Yeah, no, especially for girls, I think it’s particularly important because, you know, marriage is another blessing. And we never know — you marry when you’re in love, so you don’t know what your husband is like; if your husband is not a good man then obviously you’ve got the freedom to choose, to stand up for yourself, to stand up for your children. You’ve got the freedom to move on with your life if you decide to divorce and look after your children — but this is why education is important, because otherwise you can’t do it. You have to be a strong person, you know? Yeah, I think that’s very important. Yeah. Imagine if you had a really horrible husband, and you’ve got children. How are you going to look after the rest of your family if you haven’t got a good income, you know what I mean? So I think education plays an important role there, as well, and people need to value it because it will get you places in life. And then you can pass it on. Thanks for being part of my interview. So, you’re definitely on the right track! [laughs] Yeah, do you think the same, being bilingual? Do you feel blessed, how lucky we are? Yeah. I feel very proud to be very bilingual. Like I’m more exposed to more cultures. More regulations — and not just strictly just one thing. Yeah, I totally agree, and we are so lucky.